Toilet Seat Cover Dispensers Are Designed For Durability And Easy Maintenance. 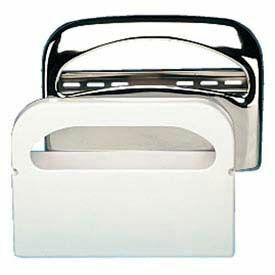 Toilet Seat Cover Dispensers are made of chrome, plastic, stainless steel or steel for long lasting durability. Variety of types, designs and finishes available to complement any restroom. Seat covers sold separately. Variety of types available to meet restroom requirements. Color finishes are Black, Chrome, Gray, Pearl White, Satin, Silver, Smoke, Stainless Steel, Transparent/Smoke Gray and White. Dimensions vary per type. Quantities are 250, 500 and 500 per side. Toilet Seat Covers Help Provide Hygiene In Public Restrooms. Toilet Seat Covers are made of one-ply, quick dissolving tissue for long lasting reliability. 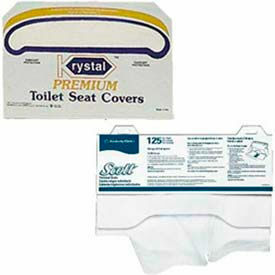 Covers are flushable and offer sanitary protection. Helps reduce litter and clogging. Available in Toilet Seat Covers, Premium Toilet Seat Covers, Personal Seat Covers and 1/2 Fold Toilet Seat Covers. Package quantities vary by model.